Congratulations on the wonderful effort with the conference. I think your contexting of the conference in the work (and by default knowledge) of indigenous people is crucial. I hope that you can persuade the organizing committee to increase the efforts of the IAI in assisting indigenous people thoroughly document their practices and engage in establishing how those practices can provide the key tools to maintain and increase soil fertility in a reducing petrochemical era. I think also that agri or biochar has a hill billy connotation when what we should be promoting is that fact the pyrolysed biocarbons (PBCs) are THE energy and agricultural biotechnologies of the 21st Century, that they are of fundamental importance in reducing fossil carbon use in agriculture and reducing the use of irrigation water, and will contribute to saving the planet by reducing global warming and sea level rise. Over 30 odd years of structural biology and materials science, I have had the good fortune to work on, amongst other things, animal and plant diseases, soils, fuel cells, purification of titanium from steel slag. More recently I have been working on charcoal/microbe/plant interactions. 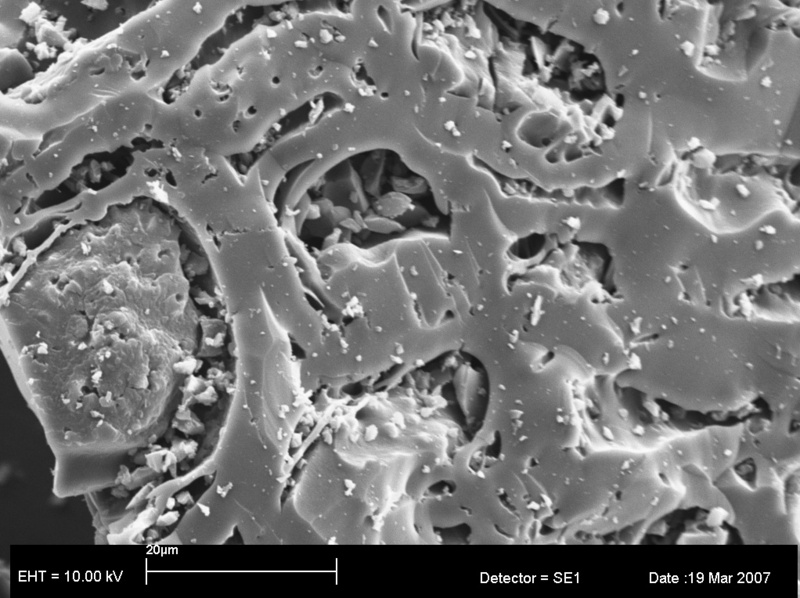 I have attached one of my most recent SEM images (21.1b.1 above). The material on the right is charcoal. 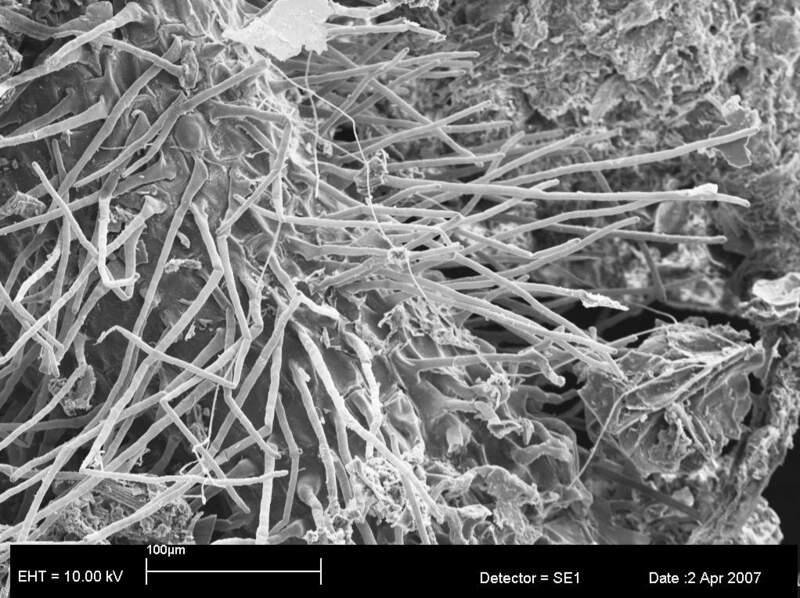 The hyphae of one of the beneficial microbes we were using are also clearly visible. Sadly the root hairs got slightly damaged in transit to the SEM. The sample was simply fixed and dehydrated in analar methanol and CPD'd. I am working in eliminating the CPD step. I think your idea of the development of a classification standard for PBCs is a key requirement for moving the biocarbon work forward. Michael Antal has done the groundwork for an analogous system required for characterizing PBCs for use in biocarbon fuel cells in his magnificent review "Antal, M. J., & Gronli, M. 2003 The art science, and technology of charcoal production. Ind. Eng. Res. 42:1619-1640" of which, sadly, I don't have an electronic copy. I am essentially a systems person. From that perspective, I think we need to consider a hierarchical classification system beginning with a clear structural characterization of the feedstock. The reason for this starting point is simply that pyrolysis, as Michael has pointed out to me on more than one occasion, is a dry distillation, essentially leaving the macrostructures unchanged. Indeed a good botanist is perfectly capable of telling, often down the species level, what tree an archaeological sample of charcoal has come from. With regard to the woody biomasses most commonly used, good old botany is a very useful ally. The structure of NZ woods (wrt to tracheid and vessel shape and size) have been extremely well characterized and I would be most suspect that the same has been done for Australian woods. - Unlike wood, they require very little pre or post-processing to make them suitable for soil applications. - Further, and perhaps most crucially, they provide a range of macropores that are more likely to approach the size of the microbes that are fundamental to determining the beneficial effects of PBCs on plant growth. A month or two ago, I began to wonder whether animal derived PBCs may be an altogether different category. Protein and chitin derived PBCs are the two main types that come to mind immediately. My initial investigations suggest that protein-based PBCs such as feathers and wool may have a tendancy to melt at relatively low temperatures. Of course their functional groups will also be different and I think there could be a reasonable expectation that there effects on plants might differ from plant derived PBCs. The structure of macadamia nut shells is very different from woody biomasses . PBC from macadamia shells (h4a1&2 below) contain some nodules which EDX show to have elevated levels of Si. Now it may be that a macro analysis of ground macadamia PBC would also show Si concentrations above background, but my contention is that the spatial location of the Si may be crucial in determining the functional properties of the PBC and should be recorded as part of the classification system. This is already clear evidence that the presence of absence of volatile material has a dramatic influence on PBC properties wrt to reactivity and cation exchange capacity. While feedstock will have a fundamental influence on relative amounts and nature of volatiles, temperature and pressure are other key linked factors that determine the concentration, and I suspect location. 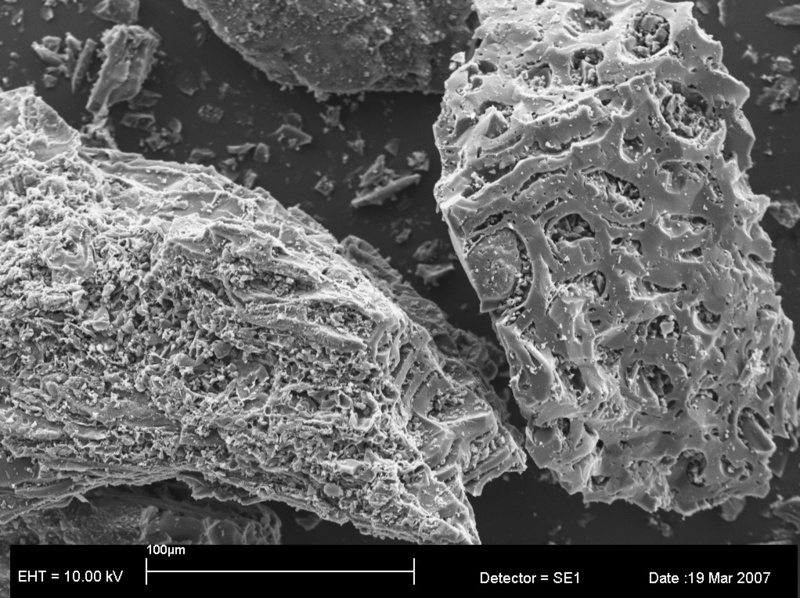 The appearance of microcrystalline graphite in biocarbons pyrolysed above at 475C appears to be associated with the development of numerous nm sized pores (see attached pdf). The effects of these on the functional properties of PBCs is even more poorly understood than the influence of volatiles on cation exchange capacity. Anyway, I hope those random musings are of some value in developing a classification system. I would be very keen to be kept up with progress in that area. Keywords: charcoal; dielectric relaxation; hydrogen bonds; micropores; water.